Does Barack Obama's Youth Vote Signal A Generational & Political Shift? I’m more inclined than most people to be optimistic about young voters actually turning out to cast their ballot; specifically, this generation of young voters, the Millennials. I say that because I’ve been paying close attention to generations since reading William Strauss and Neil Howe‘s book Generations , which completely changed the way I think about generations in general and historical cycles in particular. In short, the book examines American history in terms of generational change and argues that the reactions of one generation to another create a dynamic that produces four distinct generational archetypes that recur throughout our history. Those generational archetypes and their most recent adult accompanying generations are Hero (the GI generation), Artist (the Silent generation), Idealist (the Baby Boom generation), and Nomad (Generation X). The newest generation, the Millennials, therefore would be a Hero generation and aligned with the WWII-era GI generation. The GI generation’s accomplishments include saving the world from tyranny by fighting and winning World War II, building institutional pillars such as Social Security and the United Nations, fueled the post-war economic expansion, conquered space, and led the nation through the Cold War and the demise of Communism. The GIs were a civic-minded organization of builders. The fist Millennials have yet to cast their votes, so they’re still flying low under the adult radar, presumed to be alienated cynics who don’t care about voting, much less organizing. Yet adults who watch them perform civic tasks may sense something different brewing. Today’s school kids take the Pledge of Allegiance, and flag saluting, more seriously than Boomers or Gen Xers did. Growing Up Digital author Don Tapscott describes their “very strong sense of the common good and of collective social and civic responsibility.” Check out Kids Voting USA, Children’s Express, or the web world, and you’ll see kids discussing issues, participating in polls, and organizing mock elections, at times quite energetically. But the very fiber of the political junkie in me believes in the conventional wisdom of politics that young people do not vote. During my entire adult lifetime, election after election, young voters have failed to participate in the political process to any significant degree. Thus, even though my research indicated that the Millennials could be the exception, I was highly skeptical of the Obama campaign’s reliance on turning out not just young voters, but new young voters to an Iowa caucus system that is highly intimidating to newcomers. preferred Obama over the next-closest competitor by more than 4 to 1.” That gave Obama a net gain of 17,000 votes and he won with roughly 20,000 votes ahead of John Edwards and Hillary Clinton. But even Obama’s victory on the backs of young voters didn’t fully dispel my skepticism of depending heavily upon the youth vote. That turnout could easily be explained by the fact that the Gen X candidate is a youthful, charismatic man who naturally appeals to young people. I would have easily accepted that explanation until I read a story on Saturday about a local election here in Minnesota. In Northfield, Minnesota, we held a special election to fill a state Senate seat that was vacated due to a judicial appointment. The race pitted Ray Cox, a moderate Republican who had held a state House seat in the district against the DFL (the name of our state Democratic party) candidate, Kevin Dahle, a political newcomer. Add this to the data on Millennials’ civic-mindedness, and their votes for Obama, and I’m far more willing to believe that a fundamental shift has occurred in youth voting patterns. If young voters continue to consistently show up at the polls, then our nation’s political landscape will be fundamentally altered. Just as fascinating, however, is just how the Obama campaign got these Millennials to participate. As this Time magazine article makes clear, though it doesn’t specifically identify it as such, the campaign used the peer-to-peer micro-targeting tactics described in the book Applebee’s America to get out the vote. The book details how the Bush campaign used sophisticated marketing tactics to identify and motivate new voters to cast their ballot for Bush. By layering typical demographic data with psychographic data, they could identify Bush voters with near certainty. Based on 30 some indicators such as magazine subscriptions, what television shows you watched, whether or not you owned a gun, or a boat, and a host of other lifestyle factors, the Bush campaign found new votes in areas that past campaigns ignored because they were considered Democratic turf. The short of it is word-of-mouth marketing works best among Millennials because they trust one another more than they trust any other source. Consider the recent Pew Internet & American Life Project Teens and Social Media survey. The study [PDF] about teens’ use of social media reveals that the youths that are most active online, content creators, are also more likely to spend more face-time with their friends. By tapping into these teens new word-of-mouth networks, the Obama campaign is harnessing the youth who are most most savvy at, and the most likely to help, campaign online. They are naturals at using the ready-made online campaign infrastructure of social networking sites like MySpace and Facebook. And they are using the very people who are most influential among their peers and the most likely to get their peers to the polls because they are organizers. From a cultural standpoint, if Barack Obama’s youth vote doesn’t fail him–and we should find out if the trend continues tomorrow in New Hampshire–it will affect not only our political life but it will mark the beginning of the end of the Boomers’ cultural dominance. 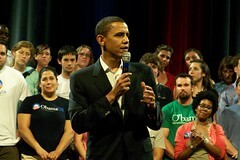 From a marketing point of view, the Obama campaign may provide a textbook case of micro-targeting, peer-to-peer lifestyle marketing in action. Indeed, there is a generational and political shift occurring, but Obama did not start it, he’s merely riding it. The shift began in 2003 when the oldest Millennials created dozens of institutions to get out the youth vote where the party and old institutions like Rock the Vote had been dropping the ball for years. I think the push of Millennial votes is a tribute to my generation. I think the advantage candidates have when campaigning to generation Yers is the most effective and has the broadest reach. Ive seen business’, employers, advertisers, and researchers utilizing technology and the savvyness of millennials to their full advantage. Viral messaging and blogging have created boundless enterprises in reaching the masses. In fact, I work with Cambria Suites and they too are connecting to their millennials in the same fashion. Check out http://www.roomforyourimagination.com for their incredible concept and hilarious video, I especially enjoy room 224, so check it out when you’re at the site.